Home Resistance News Nest 8 reporting for Duty! Nest 8 reporting for Duty! 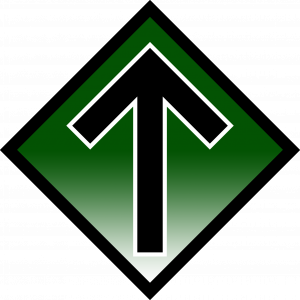 THE NORDIC RESISTANCE MOVEMENT. After hard and successful work performed by Nest 1, the nest has grown to the extent that it was necessary to re-organise it into two nests. During the Activist Days it was announced that Nest 8 now has been founded. Its chief is Niklas Yngwe. 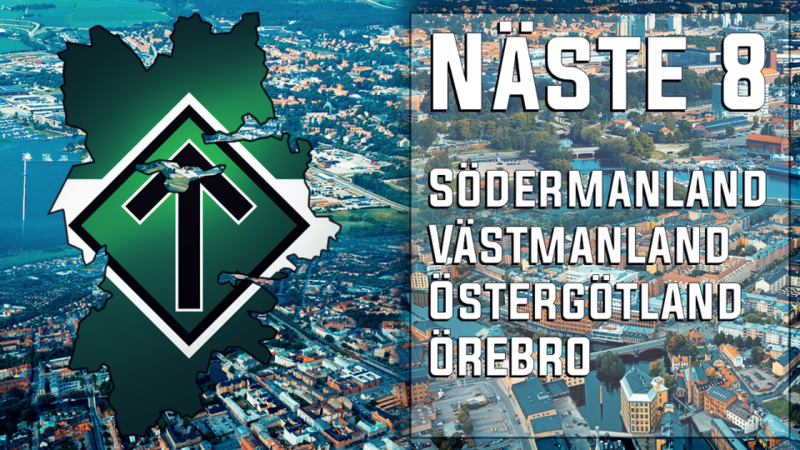 Nest 8 encompasses the counties of Södermanland, Västmanland, Östergötland and Örebro. Nest 8 counties marked in Green. Greater Stockholm is under the rule of Nest 1. 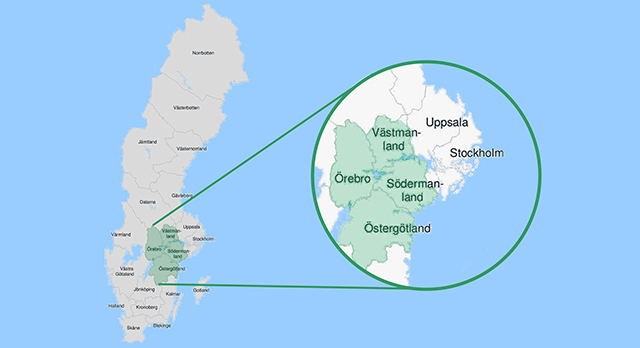 Nest 8 comprises of the counties of Södermanland, Västmanland, Örebro and Östergötland. These include several larger towns such as Eskilstuna, Västerås, Örebro, Norrköping and Linköping. The highly active action group of Nyköping, which was the fifth most active municipality action group of 2018, is now part of the area belonging to Nest 8. The counties of Stockholm, Uppsala and Gotland island remain under the rule of Nest 1. The formation of Nest 8 is a direct result of successful actions. In a longer perspective, the aim is to organically form a great many more nests around the Nordic region, due to the growth of the originally founded nests, and due to the fact that when “too large” the performance of a nest is suboptimal. This is further accentuated when a single chief has a very large and busy nest to rule over. Niklas Yngwe, who now seizes the leadership of Nest 8, is a well-known activist within the Nordic organisation. Apart from being highly active on the streets, his voice is broadcast via the Swedish language activist podcast “More than Words” to which Yngwe is a regular contributor. Mr. Yngwe is also a live reporter for Nordfront TV at various activities. Furthermore, he ran for Swedish Parliament representing the political branch of The Nordic Resistance Movement during the 2018 Swedish national elections. Will you please introduce yourself to our readers? — Sure! My name is Niklas Yngwe, I will soon turn and thereafter permanently be 30 years of age. I live in Mellösaby outside of Flen with my common-law wife, four children and presently with eleven animals of various kinds. I enjoy food, exercise, high-quality handicraft — axes, above all — and the community of the people now present within the Resistance Movement, and in the future with our whole people. I dislike liberal feminised men, noisy non-music, larger cities and crabs. How did you react when you were presented with the plans of forming Nest 8? — My spontaneous reaction was the joy of our organisation having grown to the extent that a new Nest could be established. I was also honoured by the offer of being appointed the position as chief over the Nest. I carefully reasoned with myself whether I really considered myself suitable for the task before I gave my reply. Forming a nest is, naturally, an acknowledgement of success, and in Nyköping you have been particularly active during the past year. What reactions to the decision have you been met with the members and activists? — Well, Nyköping certainly is a national socialist zone, thanks to the hard labour from equally tightly welded action groups. But there are a lot of good fighters in several of the other towns now belonging to Nest 8 that have done a man’s job during the past year. 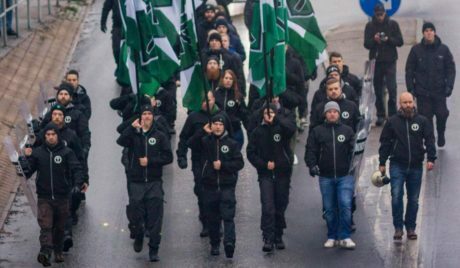 Reactions have been very positive, both regarding the formation of the new nest and the new organisational structure of the Nordic Resistance Movement as a whole. I would say it’s a primer and an impetus, and the comrades are at least as excited as I am, myself. Unannounced flash demonstration in Nyköping, November 2018. What’s the potential for growth within Nest 8? — I know there are a lot of good people in Nyköping that sooner or later will join our ranks. Örebro, Norrköping and Västerås obviously perform very well in cultivating good activists. Eskilstuna is awakening just now. I know that in the latter city there are many young people who must begin to realise that the prevailing sub culture in town is unsound. 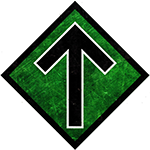 My advice to them is to break free from the decadence; commence their ideological education and apply for membership with the Nordic Resistance Movement. This is, moreover, a general piece of advice which should be carefully considered by each and everyone with self preservation bearing “skiing genes”. What are the greatest problems in connection with the separation from the biggest nest, Nest 1? — The greatest challenge will be delegating the correct formal positions to the right people in order for the nest to operate as friction-free as possible. With the right prerequisites we can focus on welding the new group together and exercise high quality actions. Are there any plans for the coming year that you can disclose at this point? — Focus will be on recruiting members of good stock and raising the quality of the present establishment. Further, there are of course high expectations on a few cutting-edge actions and a strong presence at actions performed outside of our own Nest. Raising the bar, what’s up with Nest 8 in five years’ time? — In five years I hope we have a new premises location, and that we have grown to the extent that it will be time to soon branch off yet another Nest. Any words for all interested people living within Nest 8 who have not yet joined the ranks? Yes, “what are you waiting for?” It’s not befitting for a Nord to let other people do your work for them. There will never be a time when it becomes easy to do one’s duty. On the contrary, now is high time to do it anyway. Become a part of the resistance, and neutralise the reflection of a feminised liberal man every time you pass a mirror! Public activism or spectacular activism? Activities in the wilderness or martial arts practice? Public lecture or niche, internal education? The Activist Days or the Nordic Days? Labour Day demonstration, 1st of May 2019, in Ludvika or in Kungälv? Nordfront gives thanks to Niklas Yngwe for taking the time to answer our questions and wishes for Nest 8 to create much success for itself.